70 Marlborough is located on the south side of Marlborough, between Berkeley and Clarendon, with 68 Marlborough to the east and 72 Marlborough to the west. 70 Marlborough was designed and built 1868-1869 by architect and builder Charles K. Kirby, one of eight contiguous houses (66-68-70-72-74-76-78-80 Marlborough) he built between 1866 and 1870 for speculative sale. 72-80 Marlborough were built first, in 1866, as a symmetrical grouping of five houses, on land which Charles Kirby acquired from Henry Lee, Jr. After completing these houses, Charles Kirby entered into an agreement on March 27, 1868, with the City of Boston to purchase a 75 foot wide lot to the east, between the new houses and the First Church, where he subsequently built 70 Marlborough in 1868-1869 and 66-68 Marlborough in 1870. The 75 foot lot was the western part of a 250 foot parcel extending to Berkeley, the eastern 175 feet of which the City had sold to the First Church. The City had acquired the parcel from the Commonwealth of Massachusetts on July 7, 1859, as partial settlement of its dispute with the Commonwealth over rights to lands in the Back Bay. 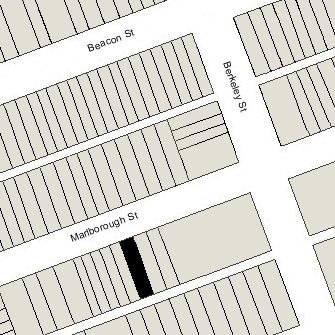 Charles Kirby acquired the 25 foot wide lot for 70 Marlborough from the City of Boston on July 13, 1868. However, when he built 72-80 Marlborough, he placed the one foot thick party walls between 72 Marlborough and where 70 Marlborough would be built entirely on the lot for 72 Marlborough, rather than placing half of the width on the lot for 70 Marlborough as was the usual custom. When he sold 72 Marlborough in March of 1868, he retained the eastern six inches on which half of the party wall had been built, and he included this strip of land (with the wall on it) as part of the lot for 70 Marlborough, making it 25 feet six inches. 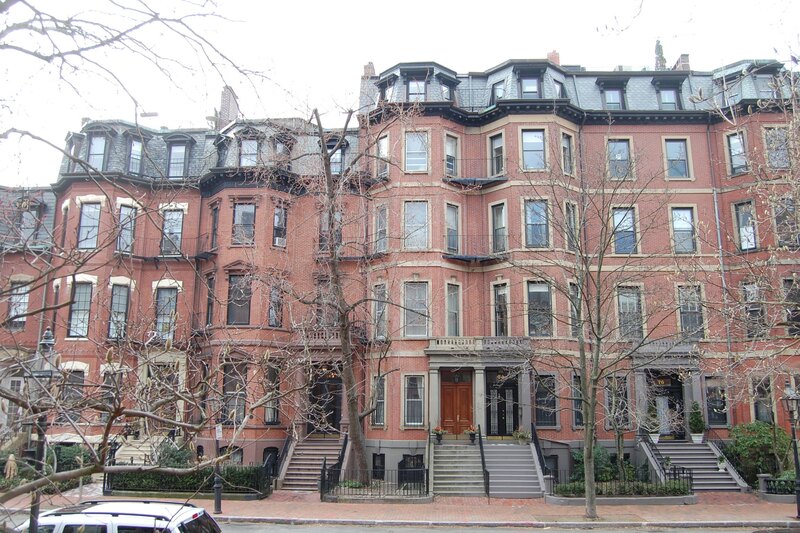 Click here for an index to the deeds for 70 Marlborough. On March 2, 1869, 70 Marlborough was purchased from Charles Kirby by Robert Henry Eddy. He and his wife, Annie Goddard (Pickering) Eddy, made it their home. They previously had lived at the Tremont House hotel. Robert Eddy was a civil engineer, largely responsible for laying out East Boston and the construction of wharves, bridges, and roads in that community. He subsequently became a patent solicitor, claiming to be the first person to establish that business in the United States. He died in May of 1887. 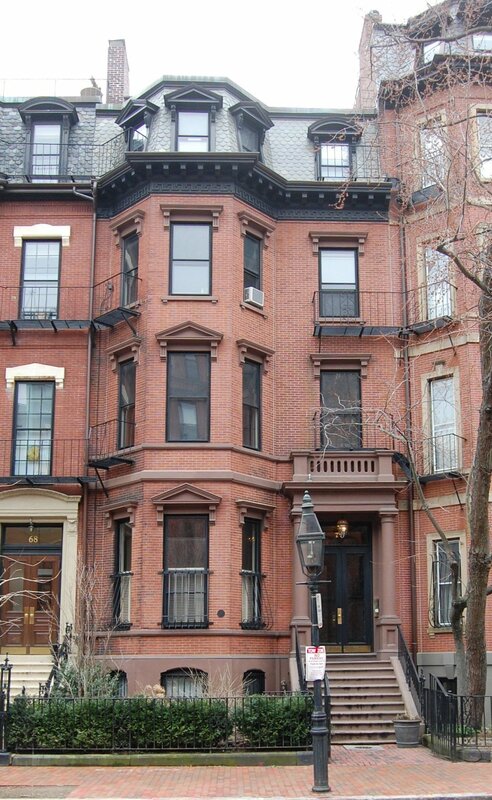 Annie Eddy continued to live at 70 Marlborough until her death in October of 1900. The house was not listed in the 1901 Blue Book. On February 1, 1901, 70 Marlborough was purchased from the estate of Robert Eddy by Mabel (Stephenson) Weld, the wife of wholesale hemp merchant Bernard Coffin Weld. They previously had lived at 39 Chestnut. They also maintained a home in Beverly Farms. Bernard Weld died in August of 1940. 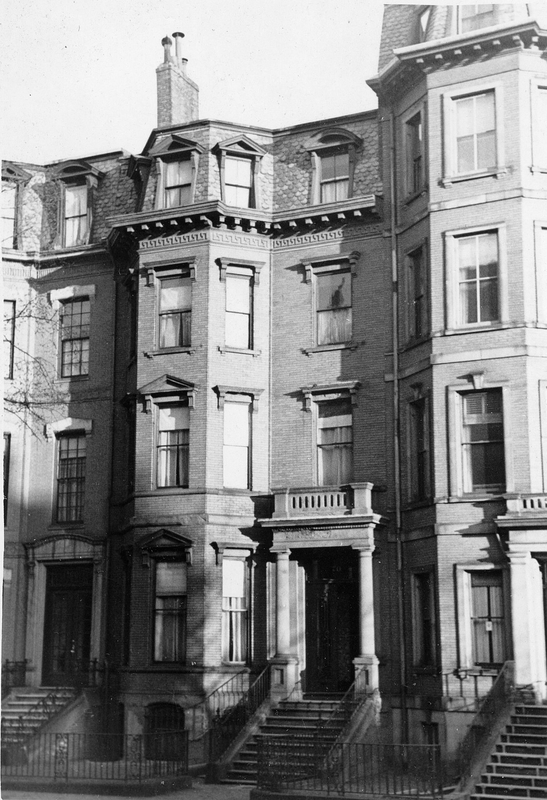 Mabel Weld continued to live at 70 Marlborough in 1946, but had moved to an apartment at 9 Commonwealth by 1947. On February 24, 1947, 70 Marlborough was purchased from Mabel Weld by real estate dealer Barney Weiner. He and his wife, Celia (Lexenberg) Weiner, lived in Brookline. In March of 1947, he applied for (and subsequently received) permission to remodel the house and convert it from a single-family dwelling into ten apartments. On January 26, 1971, 70 Marlborough was acquired from Barney Weiner by James A. Gillis. The property subsequently changed hands, and on May 15, 1980, was purchased by the 70 Marlborough Company, a joint venture of the Heath Management Co. and the KLS Management Co.
On January 9, 1981, the 70 Marlborough Company converted the property into ten condominium units, the 70 Marlborough Condominium.